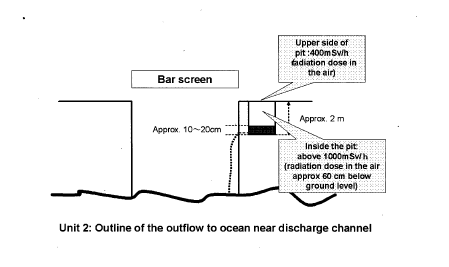 NISA press release from April 2, mentioned that water with dose rate of more than 1000 mSv/hr (100 rem/hr) was confirmed by TEPCO at around 3:20 UTC on April 2 inside the cable storage pit located next to Unit 2 discharge point. 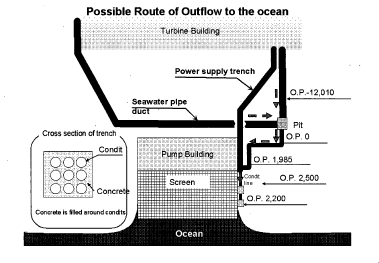 There exists a crack of approximately 20 cm on the sidewall of the pit closest to the sea and water inside the pit is confirmed and shown to be leaking directly to the sea. News reports indicate the flow of this water is approximately 2 L/sec. News reports indicated TEPCO used a polymer absorbent under hi pressure inject to try and stop the leak of radioactive water. Latest press reports indicate that this did not slow or stop the leak. Isotopic analysis of water sample inside the pit and seawater and nearby is in progress. NISA reported that monitoring was conducted for 106,095 people by 29 March at Fukushima prefecture; among them 102 people indicated levels above 100,000 counts per minute (cpm). These 102 people were re-examined after removing clothes, and measured values went down to a level lower than 100,000 cpm, there were no cases that may influence health. On 31 March, NISA also reported that among the workers at the Fukushima Daiichi plant, 21 workers have received doses exceeding IOOmSv (10 rem). No worker has received a dose above Japan’s guidance value of 250 mSv (25 rem) for restricting the exposure of emergency workers. From 3/19 to 1 April, daily deposition was recorded on at least one occasion in 21 prefectures. In eight of these, only 1-131 was detected. No deposition has been recorded in 25 prefectures. An increase in both 1-131 and Cs-1 37 deposition were observed on 31 March but levels have now returned to those of previous days. PMT considered the Japanese (JAIST) report on tap water in Tokyo showing a slight step increase in radioactivity of 1-131 from 3/18 (1.5 Bq/kg) to 3/25 (31.8 Bq/kg). These levels are an order of magnitude less than the Japanese provisional standard for adults for radioactivity in water (300 Bq/kg), which is 1000 times less than the IAEA operational intervention level of 3000 Bq/kg. In the very unlikely scenario that drinking water was contaminated at this level (300 Bq/kg), the additional radiation exposure from this water would be equivalent to natural background during 1 year. As of 1 April, restrictions have been lifted on the consumption of drinking water by adults; the remaining restriction is on the consumption of drinking water for children in the city of Litate only. The restriction in all other earlier reported locations for the prefecture of Fukushima have been lifted.